The iPad 2 may ship with iOS 4.3 on March 11, but eager Apple fans don't have to wait, as the iOS 4.3 update is now available for the iPad as well as qualifying iPhone and iPod touch models. While iOS 4.3 isn't as major an update as iOS 4.2 was, it does bring a number of new features. Another new feature is iTunes Home Sharing for iOS. This allows users to stream content from a desktop or notebook running iTunes 10.2 to an iPad, iPhone, or any other iOS device. In addition, Apple patched a few unspecified bugs and applied minor visual and operational tweaks across the operating system. Specific to the iPad is the ability to assign the iPad's side sliding switch as either a mute switch or orientation lock. Apple iPhones will receive the most notable update in the form of Wi-Fi hotspot capabilities. This feature was present on the Verizon iPhone at launch, though not found on the AT&T model. 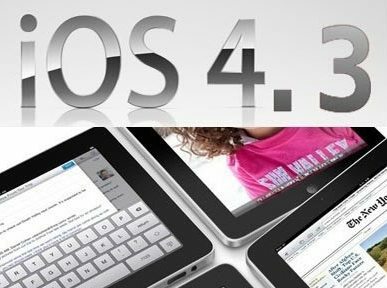 You can download iOS 4.3 firmware (IPSW files) for iPhone 4, iPhone 3GS, iPad 2, 1 aand iPod Touch 4G from the links below. WARNING: Jailbreakers/Unlockers MUST stay away from iOS 4.3 until further notice. When detected, right click on the Phone icon in left pane and then backup the apps and settings. Now download the iOS 4.3 ISPW. From the right pane of iTunes Window, click on shift key+restore button (Windows) or Option+restore (in Mac) and point it to the downloaded file. iTunes will now install the iOS 4.3 update and your device will restart with new OS after sometime.